The central dogma of molecular biology states that the flow of genetic information moves from DNA to RNA to protein. 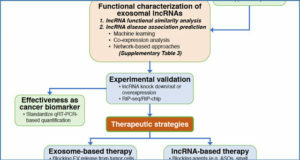 However, in the last decade this dogma has been challenged by new findings on non-coding RNAs (ncRNAs) such as microRNAs (miRNAs). More recently, long non-coding RNAs (lncRNAs) have attracted much attention due to their large number and biological significance. 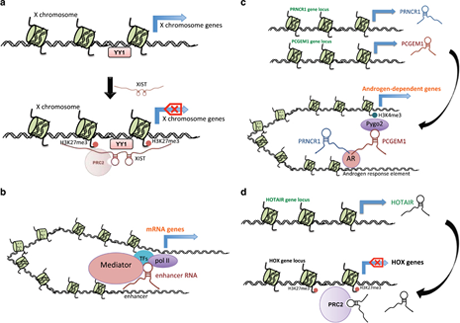 Many lncRNAs have been identified as mapping to regulatory elements including gene promoters and enhancers, ultraconserved regions and intergenic regions of protein-coding genes. 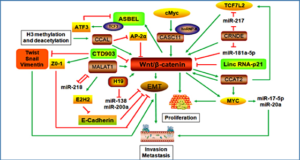 Yet, the biological function and molecular mechanisms of lncRNA in human diseases in general and cancer in particular remain largely unknown. 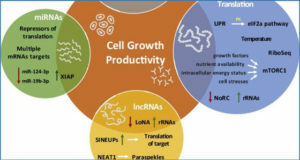 Data from the literature suggest that lncRNA, often via interaction with proteins, functions in specific genomic loci or use their own transcription loci for regulatory activity. 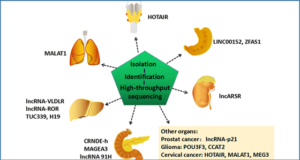 In this review, the authors summarize recent findings supporting the importance of DNA loci in lncRNA function and the underlying molecular mechanisms via cis or trans regulation, and discuss their implications in cancer. 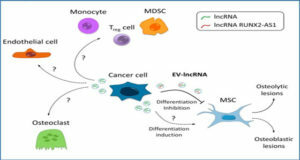 In addition, they use the 8q24 genomic locus, a region containing interactive SNPs, DNA regulatory elements and lncRNAs, as an example to illustrate how single-nucleotide polymorphism (SNP) located within lncRNAs may be functionally associated with the individual’s susceptibility to cancer.